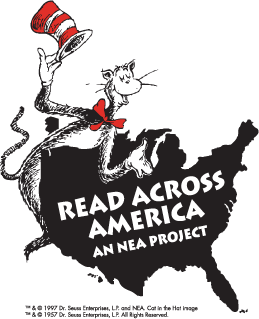 Each participant read two Dr. Seuss books to groups of elementary students. After the reading sessions, the students who participated in the reading along with the entire student body, gathered in the school's auditorium to hear the second grade students sing several songs in addition to hearing the eighth graders recite the school's pledge in a fast, upbeat tempo. Joining in the day’s event was Milwaukee Bucks Executive Vice President of Community Affairs, John Steinmiller, who addressed the students after the performances. His presentation focused on the importance of reading each and every day and touched on all the fun and interesting things you can learn just by simply opening up a book and reading. Thanks to everyone who attended or took part including Elmbrook Rotary Club members, CWA Board members and guests.